Insomnia is a real condition. It isn’t simply a few bad nights sleep, or going to bed late. Insomnia for some people is a condition that has been affecting them for years. It can disturb every part of your life from your job, to your friendships and love life. Before I used to go to sleep at 9.30 with the hope id be asleep by 12. Sometimes I literally wake up every hour. During these times it’s hard to figure out if I’ve actually been sleeping. The sleep is so light it confuses you, you drift off then wake up but roughly only 30 minutes has passed and your body feels super alert. Was I sleeping? That’s always my first thought. This is different to the I saw every hour type. With this one you may or may not struggle to fall asleep but ultimately you do not stay asleep. You wake up way before your alarm goes off i.e 3am, 4am and you’re unable to get back to sleep. If you do eventually get back to sleep it’s most probably about 20 minutes before your alarm is scheduled to go off. Either causing you to oversleep or wake up with the worst headache ever. The problem with all of these is that for someone who has to wake up in the morning for work, as the hours go by anxiety starts to set in. You start to stress about how little sleep you’re going to get, once you start doing this getting to sleep is near impossible. Now you can’t sleep because you’re stuck thinking about not being able to sleep. 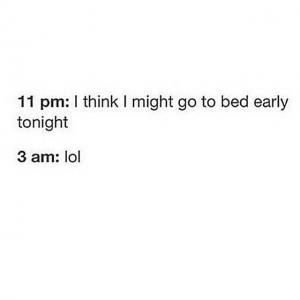 It’s a vicious cycle really.Insomnia can come and go in cycles. You have good periods and some really bad periods. A bad period for me is a week of consistently only getting about 2 hours sleep. By the end of the week you crash and have the best sleep ever and then the cycle starts again. What do I mean by helping myself, I mean have I done my relaxation routine. As an insomniac this routine is vital in trying to help you get to sleep. You could be suffering from insomnia for a variety of reasons but whatever the reason is, it’s important to prepare your mind and body for sleep. It’s almost as you have to tell yourself you are going to sleep. You have to get your subconscious mind on board with your plan. What helps me are things such as meditation, hot baths, lighting candles or reading a book. Recently I introduced two new things to my routine and it worked better than anything I’ve done before. A pillow spray called ‘this works’ is a product I will swear by, I sprayed it on my pillow before sleeping and placed the roll on gel onto my wrists to inhale. In addition to this I put on a youtube sleep music video. I chose one that was 45 minutes long and each night whilst doing this I fell asleep before the video had finished. For me this is major, something to definitely sing and dance about. I haven’t quite mastered a technique for staying asleep till the morning but I’m sure I will. If you choose not to take sleeping tablets you have to play around with alternate methods to help you. Sleep is vital. At the moment although I’m getting to sleep much easier I’m struggling to sustain it. I’m unsure if that’s because I’m no longer using the spray and just listening to the music. I must admit whilst using the spray when I did wake up I found it easier to drift back of. This week I’ve decided to try nytol for a week as Im exhausted and need some proper sleep. I will see if it can help me get into a routine alongside my night relaxation routine. The problem with all these supplements is that if they work there’s a tendency to become dependant on them, this is what I do not want hence the reason I’ll only be using it for one week. Everyone is different some people naturally have an addictive personality making them more susceptible to abusing things such as sleeping tablets. The key is to know yourself, know what is right for you, try out different methods until eventually you get it right and you are getting a decent amount of sleep. The way I’m looking at it is that everything is temporary, eventually your good cycle will outweigh the bad and one day there will be no bad cycle just a good nights sleep. All the best Dionne. Some good advice here, I know I’ve struggled with sleep issues for a long time. There are many nights when I see all hours and it leaves me feeling positively wrecked the next morning. Good grief! I was going to try to suggest something, but it seems you’ve tried it all.